The persecution of the Jews at the hands of the Nazi Government has been proved in the greatest detail before the tribunal. It is a record of consistent and systematic inhumanity on the greatest scale. Ohlendorf, chief of Amt III in the RSHA from 1939 to 1943, and who was in command of one of the Einsatz groups in the campaign against the Soviet Union, testified as to the methods employed in the extermination of the Jews. He said that he employed firing squads to shoot the victims in order to lessen the sense of individual guilt on the part of his men; and the 90,000 men, women and children who were murdered in one year by his particular group were mostly Jews. The anti-Jewish policy was formulated in Point 4 of the program [of the Nazi party] which declared ” Only a member of the race can be a citizen. A member of the race can only be one who is of German blood, without consideration of creed. Consequently, no Jew can be a member of the race.” Other points of the program declared that Jews should be treated as foreigners, that they should not be permitted to hold public office, that they should be expelled from the Reich if it were impossible to nourish the entire population of the State, that they should be denied any further immigration into Germany, and that they should be prohibited from publishing German newspapers. The Nazi party preached these doctrines throughout its history. Der Stuermer and other publications were allowed to disseminate hatred of the Jews, and in the speeches and public declarations of the Nazi leaders, the Jews were held up to public ridicule and contempt. With the seizure of power, the persecution of the Jews was intensified. A series of discriminatory laws were passed, which limited the offices and professions permitted to Jews; and restrictions were placed on their family life and their rights of citizenship. By the autumn of 1938, the Nazi policy towards the Jews had reached the stage where it was directed towards the complete exclusion of Jews from German life. Pogroms were organized which included the burning and demolishing of synagogues, the looting of Jewish businesses, and the arrest of prominent Jewish business men. A collective fine of one billion marks was imposed on the Jews, the seizure of Jewish assets was authorized, and the movement of Jews was restricted by regulations to certain specified districts and hours. The creation of ghettoes was carried out on an extensive scale, and by an order of the Security Police, Jews were compelled to wear a yellow star . . . on the breast and back. It was contended for the prosecution that certain aspects of this anti-Semitic policy were connected with the plans for aggressive war. The violent measures taken against the Jews in November, 1938, were nominally in retaliation for the killing of an official of the German embassy in Paris. But the decision to seize Austria and Czechoslovakia had been made a year before. The imposition of a fine of one billion marks was made, and the confiscation of the financial holdings of the Jews was decreed, at a time when German armament expenditure had put the German treasury in difficulties, and when the reduction of expenditure on armaments was being considered. 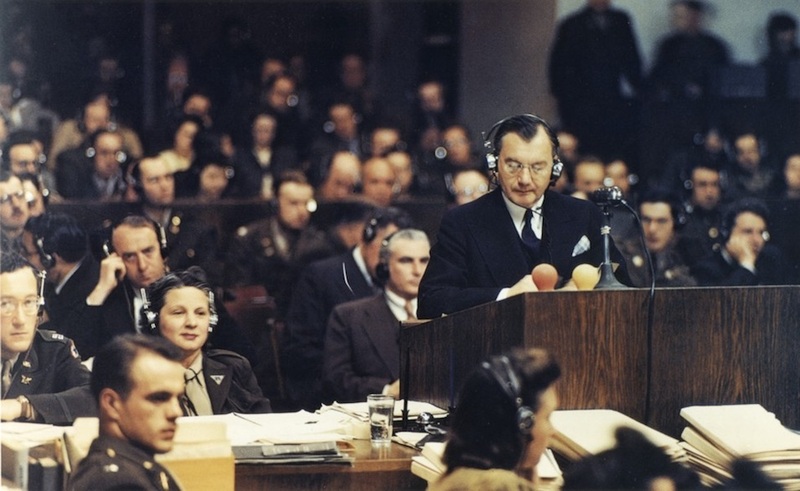 These steps were taken, moreover, with the approval of the defendant Goering, who had been given responsibility for economic matters of this kind, and who was the strongest advocate of an extensive rearmament program notwithstanding the financial difficulties. The Nazi persecution of Jews in Germany before the war, severe and repressive as it was, cannot compare, however, with the policy pursued during the war in the occupied territories. Originally the policy was similar to that which had been in force inside Germany. Jews were required to register, were forced to live in ghettoes, to wear the yellow star, and were used as slave labourers. In the summer of 1941, however, plans were made for the “final solution” of the Jewish question in all of Europe. This “final solution ” meant the extermination of the Jews, which early in 1939 Hitler had threatened would be one of the consequences of an outbreak of war, and a special section in the Gestapo under Adolf Eichmann, as head of Section B4 of the Gestapo, was formed to carry out the policy. The plan for exterminating the Jews was developed shortly after the attack on the Soviet Union. Einsatzgruppen . . . , formed for the purpose of breaking the resistance of the population of the areas lying behind the German armies in the East, were given the duty of exterminating the Jews in those areas. The effectiveness of the work of the Einsatzgruppen is shown by the fact that in February, 1942, Heydrich was able to report that Estonia had already been cleared of Jews and that in Riga the number of Jews had been reduced from 29,500 to 2,500. Altogether the Einsatzgruppen operating in the occupied Baltic States killed over 135,000 Jews in three months. Nor did these special units operate completely independently of the German Armed Forces. 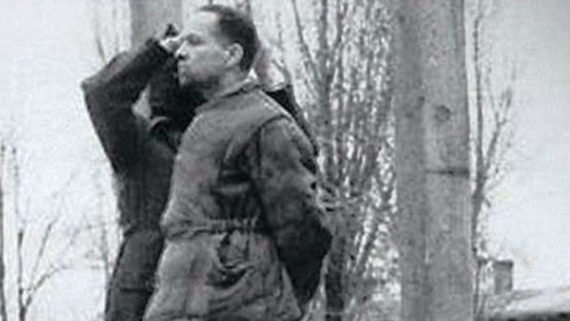 There is clear evidence that leaders of the Einsatzgruppen obtained the co-operation of army commanders. In one case the relations between an Einsatzgruppe and the military authorities was described at the time as being “very close, almost cordial;” in another case the smoothness of an Einsatzgruppen’s operation was attributed to the “understanding for this procedure ” shown by the army authorities. Stroop recorded that his action at Warsaw eliminated “a proved total of 56,065 people. To that we have to add the number of those killed through blasting, fire, etc., which cannot be counted.” Grim evidence of mass murders of Jews was also presented to the tribunal in cinematograph films depicting the communal graves of hundreds of victims which were subsequently discovered by the Allies. Beating, starvation, torture, and killing were general. The inmates were subjected to cruel experiments. At Dachau in August, 1942, victims were immersed in cold water until their body temperature was reduced to 28º C, when they died immediately. Other experiments included high-altitude experiments in pressure chambers, experiments to determine how long human beings could survive in freezing water, experiments with poison bullets, experiments with contagious diseases, and experiments dealing with sterilization of men and women by X-rays and other methods. After cremation the ashes were used for fertilizer, and in some instances attempts were made to utilize the fat from the bodies of the victims in the commercial manufacture of soap. Special groups travelled through Europe to find Jews and subject them to the “final solution.” German missions were sent to such satellite countries as Hungary and Bulgaria, to arrange for the shipment of Jews to extermination camps and it is known that, by the end of 1944, 400,000 Jews from Hungary had been murdered at Auschwitz. Evidence has also been given of the evacuation of 110,000 Jews from part of Romania for “liquidation.” Adolf Eichmann, who had been put in charge of this program by Hitler, has estimated that the policy pursued resulted in the killing of six million Jews, of which four million were killed in the extermination institutions. auschwitz.org/en/ is the address of the home page of the Auschwitz-Birkenau Memorial and Museum. Daniel Goldhagen (Hitler’s Willing Executioners: Ordinary Germans and the Holocaust, 1996) attributes the Holocaust “eliminationist antisemitism” that was peculiarly German. For a chronicle of the German response to his analysis go to yadvashem.org.